Should you be worried when they do? The funny thing is, that gnats are a general term for a lot of small biting bugs (like midges, sandflies, and no-see-ums, punkies, etc) and what might be biting you might not actually be what you think it is. Want to skip all this research and just hire a decent exterminator for your gnat problem? Biting Midges: If you're getting bit outside and you don't think it's a mosquito, then this might be the bug responsible. They are very small (1-3mm) with a greyish body. See picture below. No-see-ums: Sometimes referred to as "sandflies" are another type of biting midge that you can barely see . Most people complain about these bugs off the coast of Florida and leave extremely itchy bites! They live in many different locations and eat different foods, so it can be hard to identify which type is in your home. Take a look at the below video to get an up close view of what a normal gnat (aka midge) looks like and how it goes about biting a human. Gnats are tiny, usually only 1/12-1/16 of an inch. They tend to be black or dark gray, and it has two small wings. Gnats are unsteady and weak fliers, so they don't move great distances and have trouble flying in straight lines. When people look closely at gnats, they can see some yellow tufts and finer gray hairs, but you would need a microscope. Since there are many species of gnat, they all eat different things. Sometimes gnats will eat plants and other insects, but others eat certain breeds of fungus. The ones you should worry about (like biting midges and no-see-ums) do drink blood and do bite. If you find gnats in or around your home, it might be a good idea to spray a repellent around the property. Those who should be most worried about biting gnats are farmers and others who tend to livestock. Biting gnats have been known to transmit a disease call the Bluerounge Virus to sheep, cattle, goats, and other farm animals. When infected, animals will develop a high fever, swelling of the face and tongue until it appears blueish (hence the name). If your type of gnat hangs out near potted plants, you might have fungus gnats. Check out this guide if you do. Yes, but only some types of gnats female gnats will bite you. However, it's not the same kind of bite you would receive from a mosquito or a bed bug. When a gnat bites, it actually slices open the skin with four different cutters. It then injects an anti-clotting or anticoagulant agent so that they can eat more blood before the wound closes. 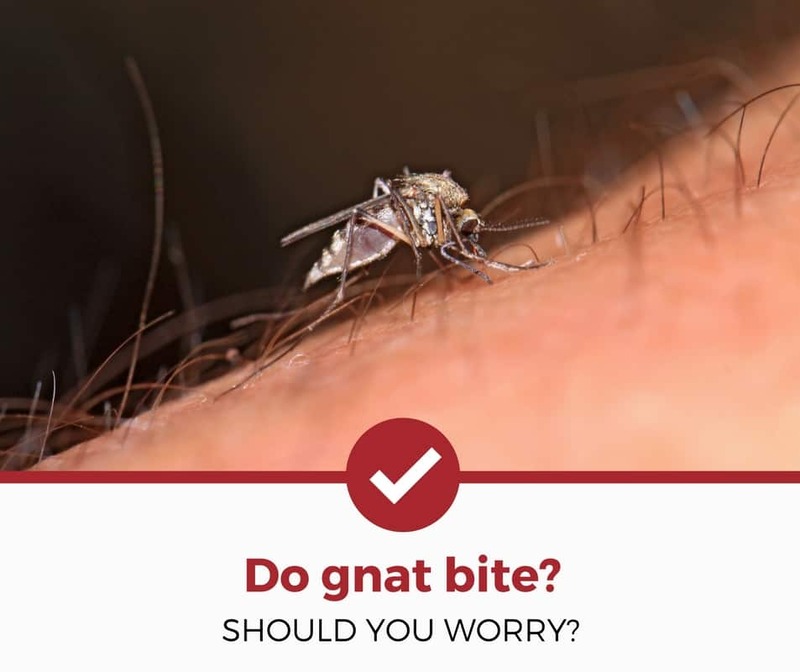 Because of the way they go about biting, gnats can actually be more painful that a mosquito or bed bug bite. The bites of biting gnats and midges cause a burning feeling. The actually reaction caused by a bite can range from a small reddish spot where you were bitten, to a allergic reactions that cause significant itching. Most gnats, even the ones which bite humans, don't carry disease as mosquitoes do. As mentioned earlier, the only diseases to be aware of is the Bluetounge Virus that typically affect livestock. Eye gnats have been known to spread pinkeye, but you don't have to worry about catching illnesses like Lyme disease or malaria, which are common in ticks and mosquitoes. You do have to prevent yourself from scratching a gnat bite, though. Too much scratching can lead to a skin infection, which can cause other problems. Apply a soothing or antiseptic lotion to ease some of the pain and help yourself prevent an infection. If you're having gnat problems, you should consider using a repellent (click to see what we recommend) and keeping your home locked tight. Be careful about opening windows and be sure to use screens without tears in the mesh. Make sure all doors are closed fully when going in and out. Many repellents can be sprayed around the yard, and electrical bug zappers are effective at keeping them away from doorways. Don't worry about being bit; bite back at the gnats instead. Want to grab some products to help you defend against gnats? Check out the below buying guides.